They’ve taken a new look at the functional space within the home and reorganized it in the plans to fit with requests from more buyers. Floor plans include up to four bedrooms and 2.5 bathrooms with an attached two car garages. Square footage in the new homes range from 1,788 to 2,088. The homes qualify for the Southern Nevada Water Authority’s Smart Home Program and are Green Built Certified. Designs can accommodate from as small as one to many more residents. Some options include hobby rooms, home offices, exercise rooms, libraries and luxurious home theaters. A play room or office can be enjoyed in the loft areas while some models offer a shared bath in the secondary bedrooms. Some features include a great room layout, appliance, nook in the kitchen, pantry, vaulted ceiling in the large master suite and a private den. Mountains Edge offers residents of Azure Canyon and other neighborhoods to a trail system, a half a dozen parks, real estate for public facilities and schools. 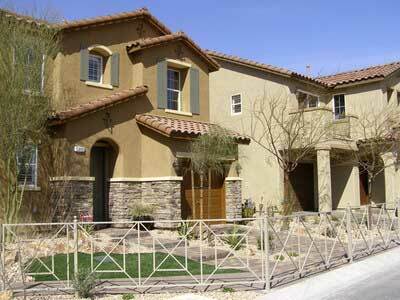 Azure Canyon homes for sale in Las Vegas, Nevada unveild at Mountains Edge.